The perfect fusion between pure dark chocolate and shaved toasted coconut makes our bar one of most beautiful experiences youÍll ever have. 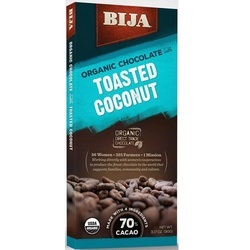 Our fresh toasted coconut organic chocolate bar creates an unbelievable flavor infusion that is the best between both worlds. Made with 100% organic ingredients, we use direct-trade cacao from our womenÍs cooperatives. Our Toasted Coconut is made with only with the essential 4 ingredients to make it taste delicious and fresh.